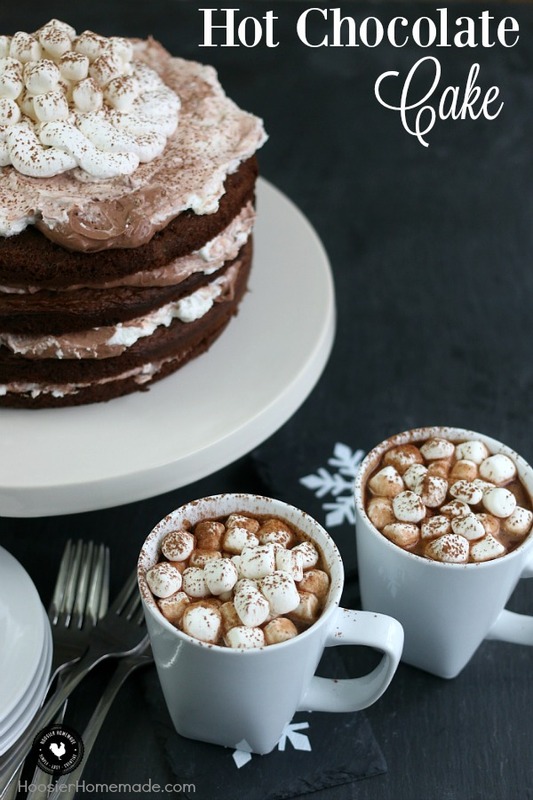 So why not create this delectable Hot Chocolate Cake to go along with your steamy mug of hot chocolate? 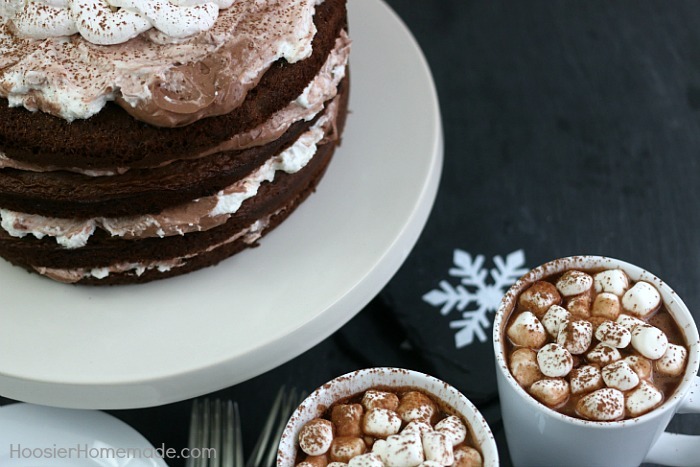 This Hot Chocolate Cake is perfect for your holiday celebration, but honestly, I think it would be great for any occasion. How about a birthday cake for the chocolate lover in your life? As you know, I love creating impressive desserts that look like you spend hours making them, but they are actually really easy. 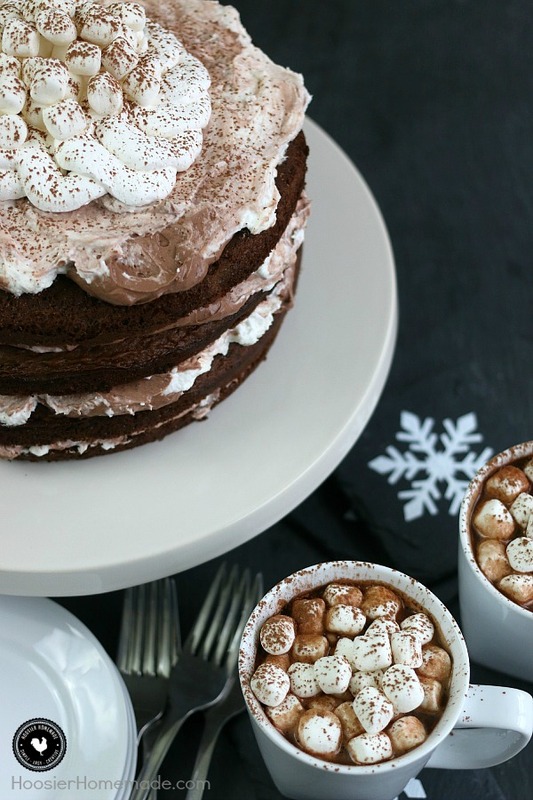 This Hot Chocolate Cake is definitely one of those desserts. Starting with the chocolate cake, I used a box mix, then added 4 eggs (room temperature), melted butter instead of oil, and International Delight Hot Chocolate instead of water. The cake is baked in 2 – 9 inch round pans, I like putting a circle of parchment paper on the bottom of the pan, it makes it much easier to remove the cake. After the cake is cooled, each layer is sliced in half, creating 4 layers. Then the layers are filled with pudding – white chocolate and chocolate pudding. 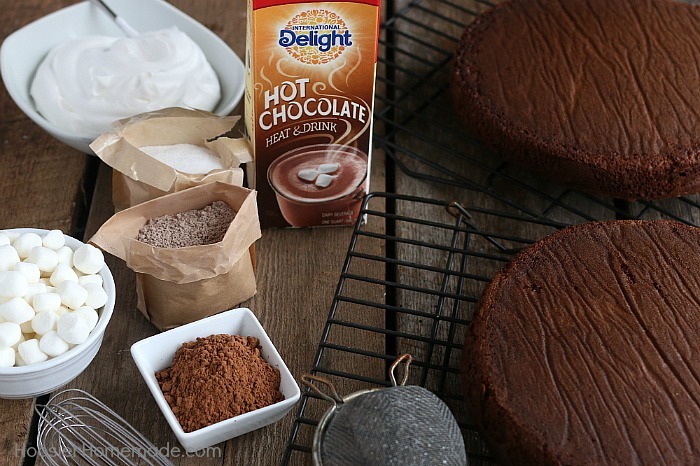 I mixed the chocolate pudding with International Delight Hot Chocolate instead of milk to give the cake even more flavor. Then both of the puddings have whipped topping folded in. To assemble the cake, place the first cake layer on a cake stand or plate, then add about 1/4 – 1/3 cup of each of the puddings, swirl them together with an offset spatula, gently pushing the pudding to the edge of the cake. Top with another layer and repeat the goodness of pudding. On top, add more pudding, swirl, and then add some whipped topping. I used a decorator bag and snipped off the end. Then a big handful of mini marshmallows and a dusting of cocoa powder. And of course, serve with a mug of International Delight Hot Chocolate, the newest in their line of holiday favorites can be found in your grocery store’s refrigerated section. 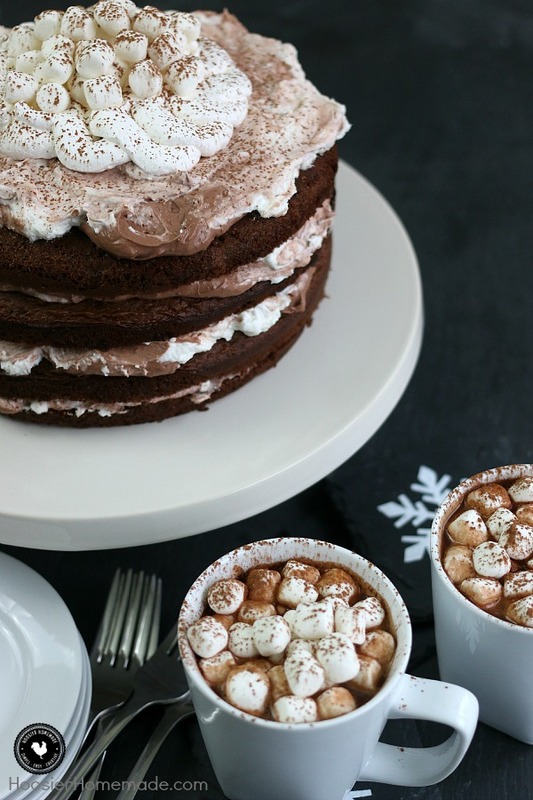 This showstopping Hot Chocolate Cake has layers of moist chocolate cake, pudding, whipped topping, marshmallow and yes, it has hot chocolate too. With these simple ingredients, you are on your way to this spectacular Holiday Cake that everyone will LOVE! Meanwhile, mix white chocolate pudding with milk, place in refrigerator for 5 minutes to set. Combine chocolate pudding with 1 cup hot chocolate, place in fridge for 5 minutes. Note: this mixture is very thick. Place 1 layer on cake stand or plate, add about 1/4 - 1/3 cup of each pudding mixture, swirl with an offset spatula, gently pushing the pudding to the edge of the cake. Refrigerate entire cake for 1 hour before serving. Store leftovers in fridge. Visit International Delight, share how they help you capture the spirit of the season for a chance to win a holiday brunch for friends and family! Hi Cheryl, you can use milk or even chocolate milk. This looks absolutely amazing. I need to recreate this. Oh my! I’m making this for Christmas! I’m also faving it this week on Wake Up Wednesday! Thanks for sharing! This certainly is a showstopping cake! Looks & Sounds Fantastic! Yum! pudding Filling! Yes please! Thanks for linking up to Merry Monday! Sharing on FB! Have a great week!